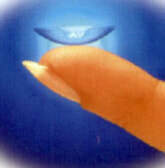 Contact lens fitting and follow up visits are done everyday at Alpert Vision Care. A proper contact lens fitting is required to help ensure optimal vision and comfort. There are many different types of lens designs and materials. We will take the time to find the most appropriate type of lens for your unique visual demands. If you are new to contact lens wear our dedicated contact lens professionals will take the time to make sure you are comfortable with the insertion and removal process. We will review proper care and cleaning for your lenses to ensure a long healthy contact lens wearing life.